If you’re a lover of all things Fantasy, Terry Pratchett is a fantastic author to fall back on if you’re looking for a fabulous read. The Discworld series of books are all based on the same fictional world, roaming through time and space on the back of four elephants, which are in turn carried on the back of A’tuin, the Great World Turtle. One of my favourite things about the series is that the books don’t really depend on you having read any of the others, so anyone can pick one up and not be lost. One slight drawback to this is that for devoted readers, you get to read the explanation as to why light travels slowly over the Discworld again and again. And again, just for good measure. Corporal Carrot has been promoted! He’s now in charge of the new recruits guarding Ankh-Morpork, Discworld’s greatest city, from Barbarian Tribes, Miscellaneous Marauders, unlicensed Thieves, and such. It’s a big job, particularly for an adopted dwarf. And so begins the most awesome epic encounter of all time, or at least all afternoon, in which the fate of a city—indeed of the universe itself!—depends on a young man’s courage, an ancient sword’s magic, and a three-legged poodle’s bladder. Men At Arms is the second book following the adventures of the City Guard of Ankh-Morpork. Our main character Carrot, born human was adopted as a dwarf and joined the Watch to make a man of himself. As mentioned above, whilst it may be helpful to have read the first book for backstories of the guards, it is not essential at all. Carrot has now been promoted to Corporal and the City Guard is recruiting. Captain Vimes is getting married to the richest, most dragon-loving woman in the city and is due to retire. Vimes is a man very set in his ways; whilst he tries to adapt to his new life as a hobnobbing gentleman, he struggles to lose his attachment to the Watch. He also doesn’t like the new recruits, a troll, a dwarf and a woman. Vetinari, the City’s leader has decided to champion equal opportunities for all. When a mysterious weapon goes missing and murders start sprouting up in Ankh-Morpork, despite their differences, can the guards rally themselves to hunt the killer down? I admire how Pratchett manages to drop in important themes within the utterly whimsical, comical and outrageous world that is the Discworld. Race is a topic that comes up throughout the book. Dwarves and trolls hate each other. Why? At some battle a long long time ago each side accused the other of foul play. Well, that’s how it started. In today’s society, dwarves and trolls hate each other because their ancestors have successfully hated each other for centuries. Why break tradition? Not only is race challenged as a topical issue, governmental corruption also features massively. Ankh-Morpork is a corrupt city through and through. Home to the Assassin’s Guild, the Thieves Guild and even the Alchemist’s Guild, to mention but a few names, the city thrives on money. For a fee, you can arrange for a certain somebody to disappear. For a fee, you can walk the streets safely in the assurance you won’t get robbed. Nobody can guarantee your safety from flying debris if you walk past the Alchemist’s Guild, however. If you happen to chance your arm robbing somebody and you don’t have a license to do so, you had best pray it’s the Guards that get you before the Thieves Guild. Colon thought Carrot was simple. Carrot often struck people as simple. And he was. Where people went wrong was thinking that simple meant the same thing as stupid. The Librarian was, of course, very much in favour of reading in general, but readers in particular got on his nerves. There was something, well, sacrilegious about the way they kept taking books off the shelves and wearing out the words by reading them. He liked people who loved and respected books, and the best way to do that, in the Librarian’s opinion, was to leave them on the shelves where Nature intended them to be. People ought to think for themselves, Captain Vimes says. The problem is, people only think for themselves if you tell them to. I’m sure like many other readers out there, I read to escape from reality for a little while. I read to forget about those bills I have to pay and to forget I have to get up and go to work in the morning… and that’s okay. I get that escapism from books. For me, it makes a goddamn fantastic author if they can achieve this and still highlight issues within our society without smacking you in the face with it. It’s there, and you know it’s there and you can choose to pay attention to it. If you want to at least. You may have been able to find the words to say exactly what you thought of the world Terry, but nothing I could say about you will ever live up to the legacy you left behind. Not all super heroes wear capes, after all. Rest in Peace – you’ve earned it. Good afternoon!! Here’s wishing you a great weekend here from our not-so-sunny little Island today. I haven’t gotten as far as I would have liked on the reading front this week. I finished Men at Arms by Terry Pratchett on Tuesday night, which I thoroughly enjoyed. This was the first book on my TBR for September. I then started American Gods by Neil Gaiman on Wednesday. In order for me to keep on track with my reading goal I need to finish a book, on average, every six days. Today is day five of reading American Gods and so far I’m only at 57%. When I started this book I was advised that it is the kind of book you probably need to read again to be able to understand/appreciate it a bit more. If anyone ever tries to tell you this book isn’t peculiar and easy to follow.. they are lying to you. It’s perfectly readable, don’t get me wrong. I personally find it’s one of those books where you read a bit, then make yourself a cup of tea. Read a bit, sort out some washing. Read a bit more. You get the picture. I need to take breaks to digest what is going on in order to continue, and that’s taking time. I’m actually a couple of books ahead of schedule at the moment so no need to panic about taking a bit more time, but it’s a little frustrating. Up until the beginning of this month I was under the impression I was about four books ahead of schedule – it was only when I was going through the books I have read this year I found GoodReads had chucked in a couple of duplicates for good measure. Oops. Better to find out now than on the 31st December I suppose!! I was reasonably well behaved again this week and only bought one book, on offer for £1.99! I subscribe to daily emails to notify me of discounted books and I came across Killing Floor by Lee Child, the first of the Jack Reacher novels. Lee Child is one of those authors for whom I have seen loads of books around but never really known much about him or his work. My mum, being one of the fonts of all knowledge in my life mentioned that her dad, my grandad used to read the Jack Reacher novels. At the time I thought about adding this first one to the list but I’ll admit I forgot. When I read the email telling me it was discounted, I figured even if I didn’t like it I may as well find out and get to know what my grandad used to like reading. I also added a couple of books to the TBR without actually buying them yet, being After the Fire, by Will Hill, The Bone Collector by Jeffery Deaver, Carrie by Stephen King and Sleeping Beauties, a collaboration between Stephen King and his son Owen. Also, following on from my post on Friday, Down the TBR Hole #4, I have added the books I decided to keep to my list. The five books I featured this time were mostly books I was interested in keeping – in fact I only discarded one. One of the simple facts of life is that a reader is always going to have a stack of books they want to read. There is no such thing as the “end of the pile” unless you are physically picking it up to put another book on the bottom. There is no end of the tunnel – that light you can really see is just for maintenance purposes. As much as this is the case, that is exactly how we want things. Much like that tub of ice cream hidden from everybody else in the freezer, you continue to eat it but really you don’t want to have to be scraping out the sides at the end of the tub. One of my favourite things about blogging is getting to see what everybody else is reading. At least fifty percent of the books I add to my list are as a result of looking at other people’s reading lists or reviews, so thank you to everybody for sharing. I am proud to be a part of this community and I hope I can inspire other people to read the books I am too. As I mentioned above I finished reading Men at Arms by Terry Pratchett on Tuesday and I will be publishing my review of the book on Tuesday next week. My next post will be on Friday and I am doing something a little different. You may have noticed that I am beginning to post on a regular basis now. Equally, you probably haven’t. That’s fine – you’ll just have to take my assurance that I am. My post on Friday will be explaining how I am managing my reading and my blog, as well as any other reading/writing projects I am doing. On Sunday (it will creep around again far too quickly) I will be giving you another summary of my week. Just one final note from me before I sign off – whilst I haven’t had an overly productive reading week, yesterday I managed to finish my first draft of a short story I am looking to enter into a competition! That’s one little victory for me. I’m exploring a re-write with a different (and I think better ending), so that’s my next little project. I have until the 15th October to submit the story, but I’m not sure if the re-write will be ready in time. I have some time off work this month, so I can only try. When this book was originally published in the 1960’s it was considered a work of science fiction. Today, with the concerns of global warming and climate change rapidly reaching new heights it is less of an abstract work of fiction and more a haunting potential reality. In the debate of the effect of our carbon dioxide emissions I’m largely undecided as to which side of the fence I sit. I cannot say I am sufficiently educated in order to make a decision; perhaps this topical read will help me come to one conclusion or another. I don’t read a whole lot of books that feature mythology… although it’s a subject I think it would be interesting to learn a bit about!! The characters within all seem to originate from different time periods as well, which may be difficult to portray or become confusing. It’s something I’ll be paying particular attention to when I do get around to reading this. Have I mentioned how much I love Brandon Sanderson?! Maybe once or twice… And just look at that cover too!! I loved the first trilogy of books in this series and its my understanding that the next three pick up quite some time after the time the first three are based. Will the understanding of metals and their alloys have advanced? What has changed? I’m keen to find out. I also have the next book after this one, Shadows of Self on my GoodReads TBR. This would be due to come up for review in my next Down the TBR Hole post. I’m going to save some time and put it through here as well. I know it’s a keeper. The clichés are back!!! We have yet another orphan on the whirlwind of destiny. Oh, she’s sixteen?! Well there’s a surprise. When I was sixteen I was too busy dealing with raging hormones and all that jazz. Truthfully I’m a little tired of these nuances of fantasy at the moment. Maybe it’s because this book aims to target a YA audience, but the prospect of a teenage girl undermining me in this fictional world, tasking herself with retrieving a locket that will restore magic instead of contending with all manner of female issues that crop up at that age, is not one I think I am of the mindset to enjoy right now. Maybe the smudge in my mind will wash away in time, but I am dropping this off my list for now. I am going to try to read more of Stephen King’s works, given that I have very high expectations following on from reading The Green Mile and Pet Sematary. This is a blend of Fantasy and Horror and I think this will make for an interesting and equally uncommon pairing. Much like Snow like Ashes, this features a child. Jack Sawyer is going on a quest to save his mother’s life. I’m keeping this on the TBR but I probably won’t be reading it until well into next year. I need to let my gripe with over achieving youths and my comparative lack of extraordinary talent drop. I can hear my mum telling me now, as she was wont to do “If the wind changes, your face will stay like that”. Oh the funny little expressions we have. Have you reviewed your TBR pile lately? What have you discovered that perhaps you had forgotten about? I’d love to hear from you! This week has been a productive week. Not only did I finish my reading list for August, I also had a few days spare to work on an additional project – a short story I am looking to enter into a competition. That is currently in the editing stage. I had some trouble drafting it initially – once I had gotten the first 500 words or so on paper I lost the spark a bit. I am a linear thinking person so naturally I was trying to write it all chronologically. I knew how the story would end but I couldn’t get there because I didn’t know what was going to happen in the middle. Having been given the great advice in these circumstances to drop my way of thinking and to write the end, working backwards, I managed to get the first draft completed. I have until mid October to submit the entry so until then I’ll be working to improve it as best I can. On Tuesday I finished Stephen King’s Pet Sematary and I thoroughly enjoyed it. Up until now I have never read any horror books because I really dislike horror films. I like thriller and suspense, but I have no respect for films that take cheap shots at scaring people by having something jump at the camera. Anyone can do that. Give me a thriller with an exciting plot and themes that play on your mind and I’m all up for that. I’ll admit I wrongly tarnished horror books with the same attitude that I have towards the films. My full review of this book will be published on Tuesday, but I can happily say that my expectations were more than surpassed. I’ve been well behaved this week when it comes to buying books compared to the five I acquired last week. Acclaimed master of psychological suspense, Emmanuel Carrère, whose fiction John Updike described as “stunning” (The New Yorker) explores the double life of a respectable doctor, eighteen years of lies, five murders, and the extremes to which ordinary people can go. As mentioned above I will be publishing my review of Pet Sematary on Tuesday next week, so I hope you look forward to that. I know I do! On Friday I will also be having a look at my TBR list to weed out some of the books I added that I no longer want to read. It’s actually quite interesting to see how my book interests have changed over the past few years. If anything, I am reading a far wider scope of books than I ever have before… which is in part what I wanted to achieve with this challenge. Last but not least on Sunday I’ll be rounding up the week with a summary. It’s Friday and the beginning of a new month, which makes for one happy weekend of reading for me! Terry has been a regular haunt on my reading list this year and this month is no exception. This next installment of the Discworld series goes back to characters who made their debut in Guards, Guards!, being the eighth of the series. As ever I look forward to Pratchett’s unique sense of humour and the escapades Carrot and company get themselves into. I bought this book back at the end of May and I have been looking forward to getting around to picking it up ever since! I have noticed a lot of reviews flying around for both the book and the recent TV series which makes me anticipate reading it even more. Where I have seen reviews, I have tried fervently to avoid them so as not to spoil it for me. What little snippets I have seen though seems positive. I also recently read my first Neil Gaiman book, Stardust, which I enjoyed too. I can’t help myself when it comes to dystopian/post-apocalyptic themed books. I quite often wonder just how much society would break down and chaos run riot in the streets if a major disaster happened to us. I sincerely hope it doesn’t *touches wood*, but it is something interesting to mull over whilst driving on the way to work or doing the dishes. Our way of life and attitudes are largely governed by other people and general expectations. Given the opportunity, just how would these rules be tossed aside and life change? Here’s a confession for you all. I broke my rule and watched the film first. Truthfully, I had heard of the book before but thinking I wasn’t going to be that interested in it, I shoved that tidbit in the mental cardboard box equivalent to the “unless junk” pile you have somewhere. Don’t try and lie to me. You have one, I can see the guilty look on your face right now. Joking aside, I really enjoyed the film. I think I had recorded it for emergency TV should the schedule be any more abysmal than it usually is. It didn’t disappoint. What I hadn’t realised until the end of the film was that this isn’t a standalone book! Bonus! When I read about this book it couldn’t help but remind me of another series I am making my way through at the moment, being The Last Kingdom series by Bernard Cornwell. This book is set a little further along the timeline of history to Cornwell’s fiction but I love the history behind it. One of my colleagues at work introduced my to the Last Kingdom series and the history of the Danish coming to Britain. I couldn’t bring myself to use the word invasion there. That says a lot. The colleague in question is Danish whilst I am British so it makes for some interesting conversations; to be fair she can see both sides of the argument. Given my love of this period, I want to learn the history from another authors perspective. In Making History, Stephen Fry has bitten off a rather meaty chunk by tackling an at first deceptively simple premise: What if Hitler had never been born? An unquestionable improvement, one would reason–and so an earnest history grad student and an aging German physicist idealistically undertake to bring this about by preventing Adolf’s conception. And with their success is launched a brave new world that is in some ways better than ours–but in most ways even worse. Fry’s experiment in history makes for his most ambitious novel yet, and his most affecting. His first book to be set mostly in America, it is a thriller with a funny streak, a futuristic fantasy based on one of mankind’s darkest realities. It is, in every sense, a story of our times. 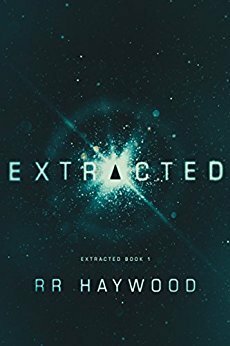 After discussing my recent review of Extracted – R R Haywood he thought I would find this book to be an interesting read as it raises some of the similar complications I refer to in my review. I also haven’t read anything by Stephen Fry before either, so I’m looking forward to that too. So there you have it – that is the official TBR for this month. Now I have said this on purpose. Normally it would be a push for me to read six books in a month. As it happens, I have a wonderful two weeks off work planned this month, (yay!!). Whilst I have plans for a few of those days, I should have plenty of time to fit in lots of reading. Can’t you tell how gutted I am?